What is dew? Why does it form? Does it form on clear or cloudy nights? What other frost factors increase the amount of dew? Can you measure how much dew is formed in a square meter? 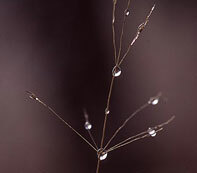 What type of surfaces are most receptible to dew? Like many other Meteorological project, there are many question to be asked and every possible answer can be valuable. Design experiments to test the conditions that creates dew. See what factors affect the amount of dew? Perform the experiments, Record your observation and draw a conclusion. Your display can include pictures and equipment that you used for your experiments.